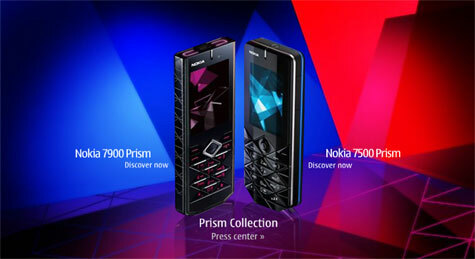 Nokia unveiled the Prism collection, its latest range of mobile phones aimed at style-conscious consumers. The Prism collection consists of the Nokia 7900 Prism and the Nokia 7500 Prism, handsets which combine individual style and state-of-the-art technology. The two mobile models will be available in the third quarter of 2007 with an estimated retail price of EUR 400 for the Nokia 7900 Prism and EUR 210 for the Nokia 7500 Prism, before taxes and subsidies. Nokia Prism collection is highlighted by cutting-edge colors, materials and graphics. Its signature diamond-cut design, featuring sharp angled lines, geometric patterns and graphic light-refracting colors, ensure these models stand out in the mobile phone market.